1st in Flowers! 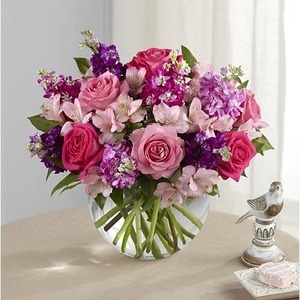 : Same Day Flower Delivery in the USA and Canada. The 1stinflowers.com approach is simple, providing a quick and easy way for people to send flowers around the world. We keep our prices reasonable and our fees much lower than most of our competitors. 1stinFlowers.com has been serving customers online for over 20 years. Our easy ordering, reliable delivery and helpful customer service has led to a 5 Star rating on TrustPilot. 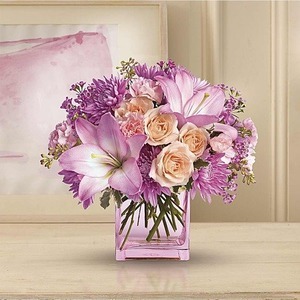 When you send flowers to the USA or Canada using 1stinFlowers.com your flowers will be hand designed and delivered by local Teleflora, Interflora, and FTD florists and flower shops. Utilizing multiple floral networks gives you more beautiful floral arrangements to choose from, and using 1stinFlowers.com allows you to confidently send flowers to practically any city in the United States and Canada. We've been having flowers delivered from Los Angeles to Houston to Miami and everywhere in between for decades. There is no need to research dozens of local florists and flower shops on your own, it's our business to know which ones are reliable and will delight our customers, and of course the recipient! People use flowers to celebrate or commemorate many occasions. Birthday flowers are the most popular and we have a great selection of festive flowers to choose from. If you just want to cheer up an old friend and we have the perfect Just Because and Get Well flowers for that. If you're trying to romance your sweetheart our Roses, Love and Romance sections and perhaps our Luxury Collection will have what you're looking for. If you need to send your condolences, you'll find thoughtful tributes to send in our Funeral and Sympathy section. If your recipient has a favorite kind of flower, it's easy to shop by flower like Lilies, Tulips or Sunflowers. If you don't know their favorite flower, just shop using their favorite color! Many of our national competitors, you already know their names, add an additional $3-$5 fee if you want same day delivery. That is on top of a service fee that in many cases is more expensive than our own service fee. Just place your before 1:00 PM Monday - Friday and 11 AM on Saturday to get delivery the same day. See our selection of same day flowers available in the US and Canada. Holidays are often the same way, they charge additional fees for the day of and sometimes the day(s) leading up to the holiday. At 1stinFlowers.com you can buy Valentine's Day Flowers, Mother's Day Flowers, or Christmas Flowers without any additional fees for delivery at a floral holiday. As the largest sender of international floral deliveries by a US based florist for the past 2 decades we feel our offerings are second to none. Whether you are sending to the US and Canada, Latin America, or Europe you can take advantage of our large selection of floral gifts, most of which are available for same day delivery! If you need to send flowers internationally follow this link to pick a country. * The Flowers were received with great pleasure. My sister in-law was celebrating a Wedding Anniversary, and this was a beautiful way of letting them know we were thinking of them on their special day. Them being in the U.S.A. and us being in United Kingdom. The Flowers were delivered exactly on the day requested. Thank You.